Now a days many applications are available in the market, all these applications will come up with some extra features and the look and feel of those applications and components will be more efficient. Swing Toolbar is used to select particular element such as desktop and various applications. The best example for Swing Toolbar is i.e while browsing something in the online user needs to perform forward and backward actions so it is possible by Toolbar. The sample example of Swing Toolbar as shown follows. 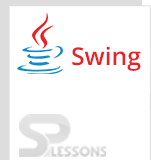 The basic example of Swing Toolbar as shown follows. Here created a button and button2 that should be added into the toolbar, created combo box also to select the input. Here created window application direction also to place on the screen with the size. After executing the above code, output will be as follows. Here two buttons and combo box has been created, each will have their own functionality, in the combo box user can select the elements and here we can the various menu also that will be explained in next examples. Here user can add different elements into the toolbar will be shown as follows. JComboBox combo = new JComboBox(fonts);//in combo box fonts have been created. Here created a class that should extends JPanel as follows. 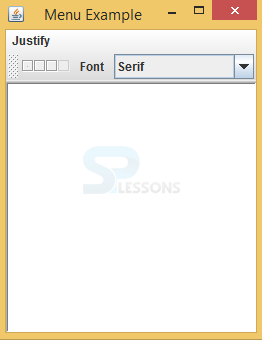 Create menubar, pane, toolbar and create font size and font text style as shown follows. Create actions while performing on menu and toolbars as follows. Create font size and implement ActionListener interface to listen the events as shown follows. Create title of the window and add instance of the window such as closing functions as follows. In this image combo box inserted, by clicking on the combo box user can select the needed font areas will be displayed, when click on Serif then it displays that Font[Serif]chosen! . Every application needs effectiveness, to do this cient will follow some protocols such as adding colors to the applications. The look and feel of application should be effective. Swing Toolbar with user interface example has been shown as follows. Create button icons, add the colors to the buttons and add buttons to the toolbar.ActionListener should perform on the buttons. Create the frame and add WindowListener to the frame. Create initPolygon(), add height and width of the diamond icon to the method. After executing the above code output will be as follows. Here user can select the color depends on the requirement and these will be useful in developing applications to color the text or background colors. Swing Toolbar – To add the more effectiveness to the application different buttons will be added to the applications. 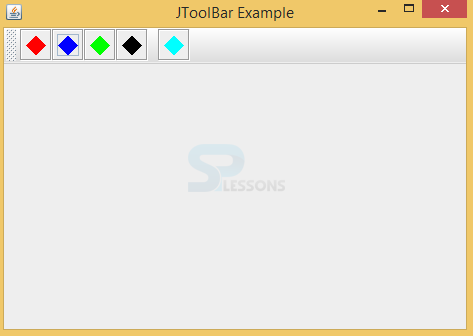 Swing Toolbar – Toolbar can have the ability to mange the software by providing row boxes. To move forward and backward tool bars will be useful.